Nonetheless, Young's book remains a standout work for me, as a volume of poetry and as an artist's powerful engagement with black and American history. African American poets have a long history of writing about slavery and narratives of liberation. Young writes within that history, but Ardency expands the tradition in notable ways. 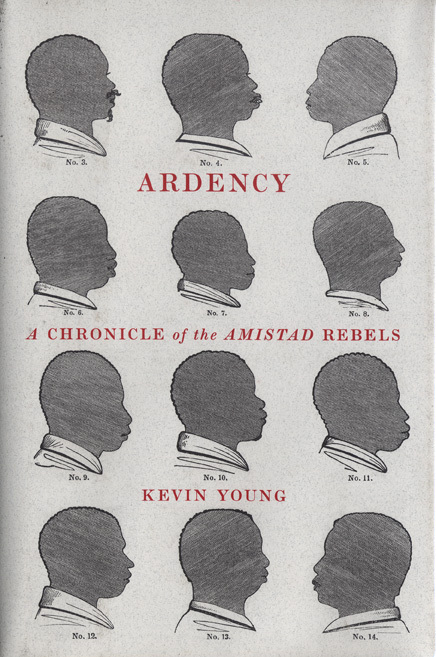 For one, Young provides an expansive book-length treatment on the Amistad revolt, and the thoroughness of his volume reveals the extent to which he has pursued extensive research on his subject. A book like Ardency demonstrates the possibilities of the poet as historical researcher. Young's volume also makes a useful contribution to black studies on multiple fronts. The work displays artistry, history, cultural ideas, and the monumental processes of Africans captives encountering America and then transitioning back to Africa. If there was a major black studies best books of 2011 list, certainly Ardency would be a top contender, right? Well, maybe I'm stretching, as I'm less sure about where contemporary poetry fits in the discourse and operations of African American Studies these days. I mean, beyond our program. I wish Young's Ardency appeared on more of those year-end "best of" lists so that more readers would become aware of this valuable black studies volume of poetry.